For Pathfinder Society, we announce the yearly themes and logos at the PaizoCon preview banquet. This works well for Gen Con releases, but not so well for events in June and July. In deciding to launch new year storylines at Origins, we needed to move up our timeline for announcements. If you want to join me, lead developer John Compton, and developer Thurston Hillman at Origins for the premiere of Starfinder Season Year 2, you can find the Origins catalog of events on the Origins website. 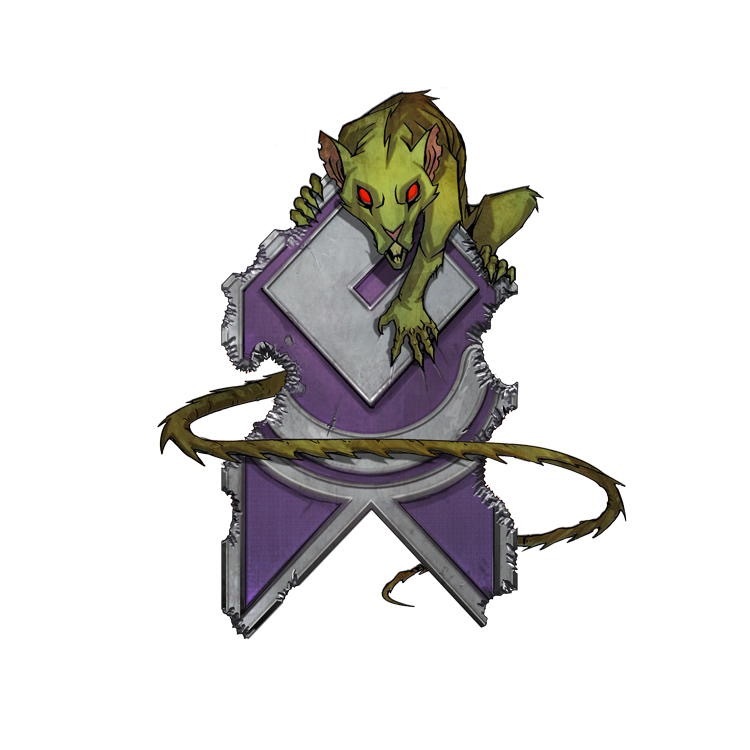 Today, the Organized Play team is proud to reveal the name and symbol for our upcoming season of Starfinder Society Roleplaying Guild content. If you’ve been following Starfinder Society, you’ll know that we’re coming into the home stretch of our Year of Scoured Stars* and that there are only a few months of scenarios left before our Origins debut for Starfinder Society Year 2. With that in mind, it seemed like a good idea to provide some information on what Starfinder Society Roleplaying Guild participants can look forward to starting in June of 2019. Let me be the first to welcome all our players and GMs into the upcoming “Year of a Thousand Bites." There’s a lot to parse and make guesses from in that name, but let me give you a bit of a preview of what this name and season represent. Taking a quick step back to the ongoing Year of Scoured Stars, the Starfinder Society Roleplaying Guild has focused a lot on a fairly sweeping “science fantasy space opera” storyline. Over the past two years of play, we’ve seen the Starfinder Society rebound from a nasty event in the Scoured Stars, come face to face with a new alien menace, and made inroads with new civilizations across the galaxy. This all culminates in our second interactive special, Starfinder Society #2–00: Fate of the Scoured God, a Tier 1–12 special debuting at Origins that bridges the gap (not that Gap) between Year 1 and Year 2. With all that in mind, our new season of play takes us back to somewhere we’ve been away from for too long: the Pact Worlds. The Year of a Thousand Bites brings us back to the Pact Worlds and re-focuses the campaign on two major concepts: what it means to be a Starfinder and the living aspect of our campaign. Being a Starfinder can mean a lot of different things to a lot of different people, and we’re going to get some insight into what people outside the Society think of Starfinders this season. We’re also going to get a chance to revisit some choices that players have made over the past twenty months of play and see how those choices have worked out. Since taking on the role of Starfinder Society developer, I’ve pushed for a campaign that lets the players decide where our story goes. It’s taken some time for us to spin up this process, but I want to re-emphasize a promise that the Starfinder Society is a representative organization directly influenced by the player base. I suppose now would also be a good time to remind all our Second Seekers faction members out there to look at getting that Rising Star capstone boon and emailing us your character description—it’s going to be very important. In fact, for all you Second Seekers out there, you’ll probably want to look at getting that to us no later than 11:59 PST on April 30th**. Starfinder Society #2–01: Pact World Warriors brings back the ever-lovable undead media mogul, Zo!, who wants a group of skilled Starfinders to participate in a series of televised events. Since the Society needs to improve its reputation in the Pact Worlds (hmmmm… wonder why they need to do that?) it’s up to the PCs to step in and participate in these—absolutely not deadly and ridiculous—events. Starfinder Society #2–02: Waking the Past takes us out beyond the Pact Worlds to investigate a recently unearthed complex on an AbadarCorp-sponsored frontier colony world. I’m sure nothing could go wrong with Starfinders investigating an unearthed set of ruins. *Ok, it's been a bit more than just a single year. **Don't fret if you can't get us those capstone write-ups by this date. There will be more opportunities later on for those who complete this! ***Bad sci-fi/futuristic pun. I apologize. Until next week, when we preview the April scenarios, I ask you all to Explore, Report, Cooperate! That Ysoki in the logo looks a little ominous. Looking forward to Year 2. Year of the Hungry Ysoki - A thousand bites. "YESSS.... This show is guaranteed to knock 'em dead!" A story line that changes with our decisions? A level 1-12 special?! AND the return of fan favorite ZO! immediately?!?! Sound like season two will be off with a bang, and I can't wait! Oh hell naw. Those rats better leave Mama Elsebo alone or theyre gonna eat plasma for sure! "Grandma don't eat that you'll get sick "
More ZO is welcome, a Tier 1-12 the special.. less so. YAY!!!!!!!!!!! I can't wait to sacrifice myself to the Tri-vid gods. Makes me wish I could go to Origins this year instead of Gen Con - darn those graduating students! "Maybe I'll get to see Dad again!" Somebody get that rat a piece of cheese to gnaw on! "Peanut butter works a lot better"
I wonder if the fact that they used "bytes" means that this is tied to the conspiracy the Dataphiles have been investigating in season 1? There has been a fair amount of suspicion regarding serpents on that front but I'm beginning to smell a rat. Second Seekers, don't forget to use your Society Shepherd boons! You work to rebuild the Starfinder Society from the brink of disaster by recruiting new agents. Benefit: If you brought a new player—a player without a Starfinder Society character or playing their first Starfinder Society session—you earn 1 additional Fame and 1 additional Reputation with the Second Seekers (Luwazi Elsebo) faction. Special: You can benefit from this boon only a number of times equal to your current Reputation Tier with the Second Seekers (Luwazi Elsebo) faction. Each time you fulfill the requirements of this boon, mark it on your Chronicle sheet along with the associated Reputation Tier. Have the GM sign beside this notation. The player you bring does not have to play at the same table as you. Lao Sho Po is destroying the Second Seekers is what I gather from the logo. Possibly a dataphiles reference in the name as well? Maybe Historia 6 is now a follower of Lao Sho Po and is now a bad actor? Very interesting possibilities. Also, the distinct lack of Platyparians disturbs me. Platyparians should be acknowledged as a species and we should be admitted into the ranks of the Society! The living aspect of SFS is the most engaging part of the campaign. I can't wait to see where we, the players, end up taking the society. Keep increasing the consequences for player decisions, please and thank you! So I made a huge mistake. It should be Year of a Thousand Bites, like rat bites, not Bytes, as in computer bytes. I apologize to everyone for starting thoughts down the path of Dataphile conspiracy theories, Historia-6 as a Laoite, and the other commentary above. That was not my intention. I had a scatterbrain moment and grabbed the wrong spelling. I've asked our webteam to update the spelling asap, so that the correct name gets out in public. TL;DR I goofed, huge apologies, and Year 2 of the Starfinder Society is Year of a Thousand Bites. Thanks for the heads up. I corrected the entry on the Origins submission website, so it should update soon. Sorry Tonya, its too late now. The conspiracy is out now. So it's pretty much confirmed that the season is about Ysoki hackers trying to destroy the second seekers. We see right through this attempt to get us off the trail of Historia 6s wrongdoing. Trust me... this really is just the beginning of what's in store! I can say that this will certainly be a season for you to keep on top of! I just hope we get a slew of 9-12 and 11-14 scenarios . . .
Or maybe some APs that run from 13-18 . . . This is something we're still looking at building up. Much like how the latter half of Season 1 has a strong number of mid-tier scenarios. The Tier structure is very much like a pyramid, and we need to make sure we can support enough low-level and mid-level play. I'm all for high-tier content, but it's balanced against a lot of other opposing factors. That being said, you can expect to see some higher-tier scenarios as we reveal more about the season (though I'm not going to say how high / how many at this time). Only a thousand bytes? How far behind is Pact Worlds computing technology? I suppose now would also be a good time to remind all our Second Seekers faction members out there to look at getting that Rising Star capstone boon and emailing us your character description—it’s going to be very important. In fact, for all you Second Seekers out there, you’ll probably want to look at getting that to us no later than 11:59 PST on April 30th**. Damn, I still don't have the rep for the capstone. Ah well, there is no way anyone would be able to handle the agenda of Tsozok the Unyielding! He would've put us on a war footing! Do we really have the budget for a Starfinder Super Colossal capital ship? I fully understand - a lot of us here are outliers with having multiple higher level characters (I will have a 12, an 11, and a 9 by Gen Con). That said, I heard from a friend that you are more likely to get higher tier content if you ask for it . . .
Hehe, a Thousand Bytes. I can say, in all honesty, that that is glorious. I vote you lean into it, and change it back. Surely the back half of Year 2 is still in planning & development, right? Change those rat ninjas into rat hackers, and that rat monstrosity into the dreaded murine cybertyrant, and boom - best of both worlds! Year of a Thousand Bites: So all of the Ysoki are going to get infested with space fleas that carry the plague? Got it! Starfinder Society #2–01: Pact World Warriors Since this is a -01 I will assume it is going to be a 1-4. That's a shame since my Zo! loving, vid-gamer icon is level 8 now. But I suppose my Skittermander Slapdancer with the Rabid Fanbase boon could use a little publicity. April 30th deadline Speaking of my 8th-level, Second Seeker, vid-gamer icon Envoy, I am 1 adventure away from having enough reputation to get the capstone boon. The bad news is it is hard to find people locally that can play high level SFS mods with. The good news is I am going to a Con in 2 weeks that is offering some. Here is hoping for the new Second Seeker PewPewFry!!! Right now (correct me if I am wrong) you can only reach level that tier by tactically using AP credit, I am not a huge fan of requiring players /GMs to plan like that. Locally we are likely to have some players in the 9-10 level range, but those are the ones who are consuming all of the APs and every new scenario an annoying speed (I literally can't offer new SFS releases for these players at my events). Of course, there is also the fact, that some but not all of those players are also on the short list of GMs for this event. I am not entirely confident that a table in that sub-tier is going to happen, because of the limited number of players. I really do not want to schedule a table of 3 players + pregen, since those can easily collapse (and multi-tables are generally built for 4 player tables) of one player drops out due to sickness. If that happens I will have a very unhappy GM who has prepped a subtier he is not going to run (and will have maps, miniatures etc. that might not be too useful) and players I would either have to ask to switch characters, or force them to play down which depending on table setup, might not be an option (or be pretty boring for parts of the table). I realize that this might be a local issue, but I am not thrilled that players would have to play the AP in order to be able to play at every table our event offers (I know they could play up, but in SFS I really would not recommend it). This might be a local issue, but players tend to build a number of characters to get a feel for the system instead of just playing the same character, it's not great but on the flip side it allows us not to drag scenarios into another subtier (to prevent some players being unhappy about it). On a related note, can we get level 12 pregens before the special releases? That would solve a number of my scheduling problems. I think you may be misreading the Tier. The Tier is 1-12, not 11-12. That means you don't need to have any 12th level characters at all to play it. It's just like the Scoured Stars Invasion. You can play it with brand new first levels if you like. You just have to have enough people in the right level band(s) to make enough tables. I can see where you would be concerned otherwise, though. Yes, there are people who've been going onto the level 12 bandwagon (in fact, I recently ran an event where a few players were discussing surpassing it). The intent of this Subtier range isn't to cover them. Instead, these higher Subtiers exist to cover regions that don't run the interactive right at release and that would likely be running this closer to the start of next year, where these extra Tiers could be a huge help entice experienced players. Another element of this interactive, is that we want to make sure that this it is appealing for players to play years from now. I know there's several communities that routinely pull "old specials" out for playing at local events, and several of them specifically use these for what higher level content they can gather. Finally, I know that if we presented another Tier 1-8 interactive, people would decry the lack of level advancement and (falsely) proclaim that the "Starfinder Sky is Falling" which it is most certainly not! In fact, I'm so very excited for some of the big changes coming up in Season 2, along with delivering on some promises I've had since the beginning of the campaign. All that being said, I'm actually somewhat pleasantly surprised that for once someone is requesting "less Subtiers", especially after receiving a lot of feedback on #1-99 and how people were disappointed it only went as high as it did! Looking forward, we may review the Tier ranges in the future, more because of the size and required time in these monumental projects than out of us trying to keep a level cap on things for Society play. I think future proofing the specials by including the higher tier is a good thing. I am fine with a level range of 1-12 although locally we got nothing higher than level 9 at the moment. I think we won't do a 11-12 subtier of 2-00 for a lack of suitable characters, but we didn't do a subtier 7-8 in 1-99 either and it was no big deal. Right now i don't see the need for 9-12 or even 11-14 scenarios as was suggested above. People are barely able to get to 9 without APs and it will take some time until we get enough releases to make lvl 11 possible without APs. In my opinion unless a level can be reached by only playing SFS scenarios it does not need to be supported. If these higher level scenarios start to appear i feel it is mandatory to produce another tier of pregens, somewhere between level 10 and 12. To be perfectly honest...when I ran tables at Con of the North for the 7-10 scenario. There were 6 slots booked and I was to GM 4 of them. 2 tables made it with 3 players and a pregen. (must be said out of my 6 actual players, 3 played pregens cos no level 7) I literally had a table with 1 playing a level 7, 1 playing a pregen and 1 playing 2 pregens. So out of 3 actual tables, there were about 6 or 7 actual characters. I'm sorry but in my eyes, that means we need more 3-6 and 5-8's first. I know this isn't the case in a lot of places, but at the moment that 7-10 is one I'm saving and is going to be a special scenario to run here as it's so exclusive and difficult to get to. TLDR: Bring on more 1-4, 3-6, 5-8's and let's have 7-10, 9-12 be exclusive and rare for this season at least! But of course, that's just my humble opinion! For cons I agree with you completely. For conventions we need tiers 1-4 and 3-6, lots of them. I worry about running tier 5-8 and above at conventions because the people with characters at that level have already played those scenarios locally before the con. Brand new scenarios are a different story. But organized play isn't just about conventions. The life blood is local groups running weekly or biweekly games. That's what keeps the community going, and building, and without those players the conventions don't have games to run at all. And the local players are the ones begging for higher tier content. Despite the fact that I have a couple characters up there in level, I agree with the sentiment wholeheartedly. There is absolutely no need for 11-14 stuff yet. Maybe a 9-12, or two, in this next season. Though I would like higher stuff, I fully support Thursty's plan and rate. Enthusiastic Starfinder groups, like mine, will just have to be patient. I recently purchased a bunch of mousling minis. When my Starfinder players noticed them, I rather tongue in cheek said that Ysoki would be the big bad villains in the next segment of our Starfinder campaign. Is it possible that I was actually on to something here? Before people begin calling doomsday on the tier ranges for our next season, I'd like to alleviate some concerns. As I've said since Day 0, the Tiers for Starfinder Society scenarios are very much a pyramid structure, which need to be enforced with a strong number of low-level scenarios. However, we also want to make sure that our higher level players get some chance to shine during the course of the season. While nothing is fully locked in stone at this point, I know that current plans are looking like we'd have Tier 7-10 / 9-12 scenarios in proportions that people have mentioned that they'd like to see in this thread (assume in the 3 to 4 range). For several of these planned scenarios, they won't be related to the ongoing Season 2 metaplot, and some of them instead build upon other ongoing storylines as carry-overs from Season 1 (thus rewarding those higher leveled players). That being said, there's going to be a more solid base of mid-level content to support people this season, including some other plans in terms of different scenarios that I'm not quite ready to announce. As i have already mentioned, if you release a 9-12 we need pregens for that level. Otherwise this will end up like Eyes of the Ten in PFS which got released in seasons 1 and 2 and bareley got played for the first few years. Another problem that i see in higher level scenarios is the difficulty. While at levels <=5 most characters are still quite equal in power, once you reach higher levels the gap between strong and weak characters starts to widen. So it gets harder and harder to produce encounters that are not a joke for the strong characters without being a TPK for the less optimized. I guess my crew in the Seattle area may be an outlier. We have played each weekend pretty consistently for over a year, after playing sporadically for six months or so before that. And I have also been running APs every other Wednesday for around 6 months due to player demand. Because we were chewing through the SFS scenarios so fast, we also started running APs every other weekend instead of scenarios for the past 6 months or so. Because of this, my group of regulars (7 including myself) have a wide range of characters, including a couple higher levels each. On top of our local play, we also have several local Cons in the Seattle-Portland area (Shout out to Arc Riley in Portland for being such an awesome organizer who gets my vote as PNW Starfinder Venture Captain!) which gets us even more table time. Maybe we are too crazy for this Starfinder game - but we only really play a couple times a week at most. I am also pretty confident there is a similar group of folks in Portland as well. Its a great game, so I find it hard to believe that there are not other pockets of Starfinder regulars out there looking for some higher level content. All that said, I am happy enough to build new characters with lower tier content as well - I would just like to play my higher level characters more than once or twice a year. To get a clearer picture of how much these higher level scenarios are needed it would help to look at how often existing 5-8 and 7-10 scenarios were reported in comparison to lower level scenarios. There were instances in the past when the activity in certain forum threads was not representative of the needs of the global player base.